As might be expected based on a day where the temperature strugglied to reach 30 degrees, only two intrepid riders showed up at Vero Café. After a soul warming cup of coffee, it was time to put wheels in motion. Our collective decision was to ride up the valley to stay away from as many frosty traction compromised corners as possible. After plugging in the Gerbings gear, off we went to Brownsville. Riding through Coburg, it was time to notch up the heat on the magic little knob! I would describe our ride with two words, “chilly and pleasurable”! 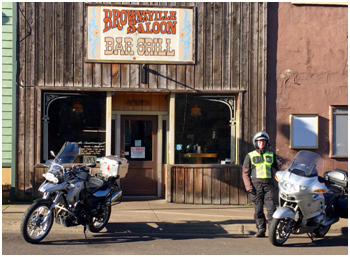 Upon arriving at the Brownsville Grill it was a few cups of tea and coffee while we waited for our “chili”. Our return route took us through the thriving metropolis of Halsey and back to Eugene. It was a beautiful sunny day and at best we clocked 50 miles …. but even short rides are better than no rides at all.